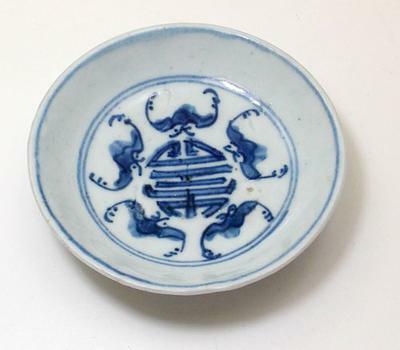 I posted a photo of this dish on the Asian Art board and got this reply It is about 4 1/2 inches by 1 1/4 inch in size. "I think this is genuinely an antique porcelain. It is a "minyao" piece of a shape often seen in export to Japan from the Transitional Period (1600s). The footmark is a shop mark. However, does anyone think this might be a 19th century piece? The design of five bats surrounding the word "shou" (ie the Five Joys surrounding Longevity) looks sort of 19th century to me. So does the smooth rim and the lack of chatter-marks on the base. On the other hand, there is something about the footrim, the flaws in the glaze and the colour of the blue that makes me think Transitional. Anyone want to chip in?" There have been no further comments on it and I am very curious about it. Would like further opinions. Thank you for your comments on the bat bowl. I am pleased that it is an antique. This is a learning experience and I enjoy it. This and the cricket jar and a pretty little cricket cage were bought at a yard sale last week for very little. On a humorous note, it looks like the Vulcans (Star Trek) must have visited China in the old days. The character in the middle is for long life and the bat symbolizes prosperity. The little bowl is therefore saying "Live long and prosper"
Think I will keep that one. Yes, the bats look like 19th century. Please note the shape of the foot rim. It looks as if it were oblique on the side. Foot rims that are oblique on the outside or both the outside and inside were made in the 18th century. That again means the body would likely have been produced at the latest during the Jiaqing period. However, a lot of (bisque) fired porcelain was not used/painted until the Jiaqing period. There is lots of porcelain plates with such foot rims but later painting on them/ Although bisque firing would usually be used for on-glaze decorations, it is thinkable that some bisque may have been used for blue and white decoration and a second firing. Therefore, I would think it possible that this is early 19th century, judging by the bats. BTW, I have seen the mark without double ring on early 19th century porcelain before. Porcelain made in Jingdezhen kilns in the Ming dynasty did have foot rims that were straight up (not oblique) at the sides, normally.